Of the more than 4,800 species known to science in the order Anura -- frogs and toads -- many could be described as toads. “Toad” just means a warty frog, usually one well adapted to land. Not all of them appear in the pet trade, of course, but dozens do and they all have different needs. Most toads require the same basic care but important details, for example temperature and humidity, can differ enormously. For this reason, always research the species you want to keep as a pet in some depth beforehand. Create a vivarium for your toads. One of the simplest ways to do this is to take an old aquarium, even one with a leak, and turn it into a terrarium. The light also ensures that your pets get enough vitamin D. Add a few inches of a suitable substrate, such as chemical-free potting compost, some moss and a shelter. Suitable amphibian shelters are available from reptile supply stores or you can make your own from a plant pot. Position a reptile heat mat under one end of the tank, if this species requires a warmer habitat than room temperature. Adjust the thermostat on the heat mat as required. It is important to place the heat mat under one end of the tank, rather than in the middle, so the toad can move to the temperature he finds most comfortable. Add a shallow bowl of dechlorinated water to the tank. Check the humidity with a hygrometer, widely available from pet and home stores. If it is lower than your toad species requires, raise moisture levels by moistening the moss, adding another dish of water and misting as required. Feed the toad on live invertebrate prey of a suitable size, i.e. small enough for the toad to swallow whole. Suitable foods might include crickets, earthworms and mealworm larvae. Dust the food with a calcium and vitamin supplement for amphibians about once a week according to the instructions and the needs of your species. Remove feces and uneaten food, and change the water every day. Clean the tank as required. Depending on the size of the tank, the conditions and the toad species, this might be once a week, once every couple of weeks or once a month. Transfer the toad to a holding container, dispose of the substrate, rinse the tank and accessories, and put everything back together again with fresh substrate. 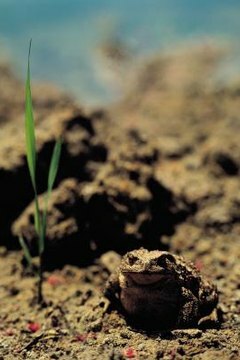  Toads live for a long time if looked after properly, often 20 or 30 years or more. Do not acquire them as pets unless you can make a long-term commitment.  Some toad species, for example oriental fire bellied toads, require a semi-aquatic environment with a large water area. In this case, set up a freshwater aquarium with a raised land area. ⚠ Don’t handle amphibians unless absolutely necessary. Your skin contains oils that are dangerous to them and they might be carrying salmonella, which is dangerous to you. This is one of the reasons that they are not very good pets for children. ⚠ Never use harsh cleaning products to clean an amphibian’s tank. These substances are toxic and could kill your pets. At the most, use a vinegar spray, dishwashing liquid or an amphibian-safe disinfectant, and even then rinse very thoroughly. ⚠ For the same reason, only ever use distilled or at least dechlorinated water in the drinking bowl and to moisten the substrate. Toads are very sensitive to chemicals in their environment. ⚠ Never release an unwanted toad “into the wild” unless he is of a species native to the area and was caught locally (for example, as a tadpole) in the first place. If you need to rehome a toad, contact a local animal charity, reptile club or zoo for advice and assistance.